ISSIE BRODY was born in Russia around 1898 to Mr. and Mrs. Solomon Brody. The family came to America in 1907, eventually settling at 101 Chestnut Street, where the Solomon Brody conducted a grocery store. Older brother Jack Brody was killed in action while serving with the United States Army during World War I. When the census was taken in 1920, Mrs. Brody had passed away. The family then consisted of Solomon Brody, Issie Brody, sisters Sylvia, Anna, and Vera; and brother Louis Brody. 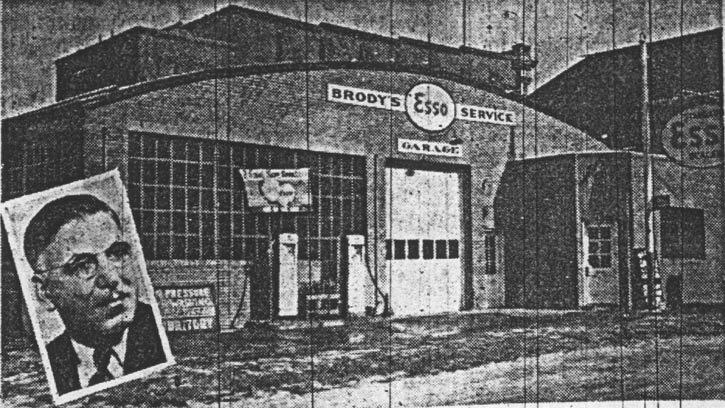 In 1935 Issie Brody opened a car wash and detailing shop, an "auto laundry" in the parlance of the day, at 540 Washington Street where he also stored vehicles and performed oil changes and lubrication. 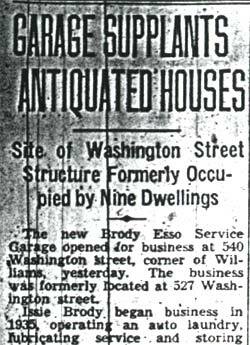 He lived at 540 Washington at the time. 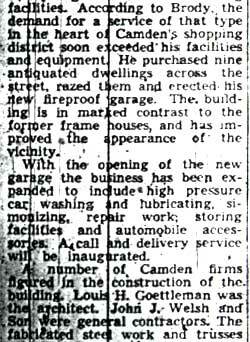 Over the next 4 years he acquired a total of nine properties across the street, and in 1939 had built a new garage where he repaired cars and sold Esso gasoline, at 527 Washington Street, the corner of Washington and Williams Streets. 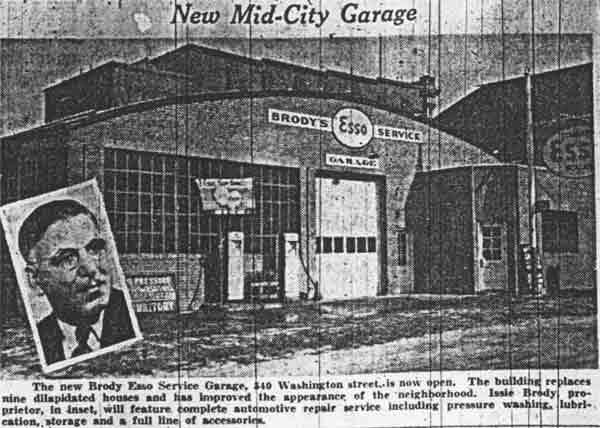 The new garage, known as Brody's Esso Service, built by John J. Welsh & Son, opened in January of 1940. 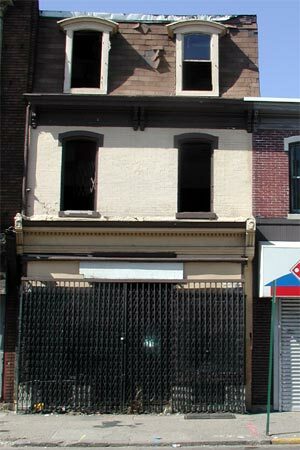 By 1947 he had moved to an apartment over a ladies' hat & bag store at 403 Broadway, a short walk from his business, with wife Mollie and son Ormond Brody. 403 Broadway then sat between Wallen's Jewelry and gifts at 405, and Leo's Appliances and Jewelry at 401. 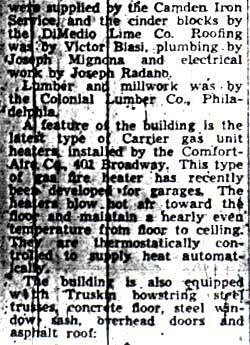 Issie Brody remained in business on Washington Street through at least the fall of 1959. 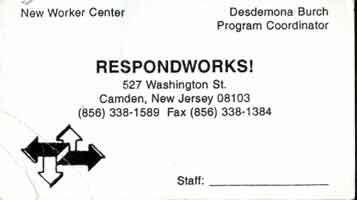 In 2004, the Brody Esso building houses a "welfare- to-work" training facility, known as Respondworks! 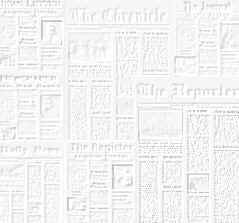 It is the New Worker Center of Respond Inc.